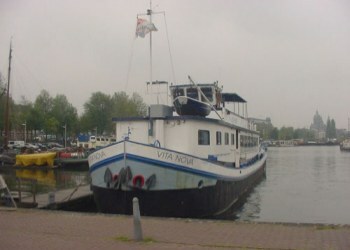 The Vita Nova, originally named the Tijdgeest was built and launched in 1913. It traveled in and around Holland carrying various types of cargos in the winter and pleasure passengers in the summer. The first passengers were members of the Christian church and had to sleep in hammocks slung between the decks. The present owners took over the boat in 1996 and after a major refit, it has been used for the pleasure routes ever since. 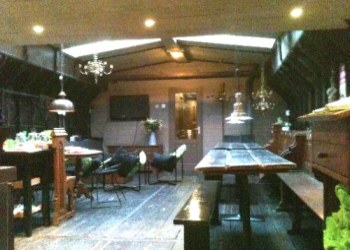 In the summer, she can be found cruising the waterways of Holland and the rest of the year, she is moored in Amsterdam close to the central railway station and is used as a floating hotel. There are twenty four cabins on two decks, cabins are one or two berths with or without shower; there are separate showers on both decks. A spacious day room with seats for fifty persons with a bar, or if you prefer a bright sun deck where you can relax and enjoy the air.